Let’s show some love to TP who lost 85 pounds with weight loss surgery. She was dealing with a number of serious health issues and decided that surgery was the best option. 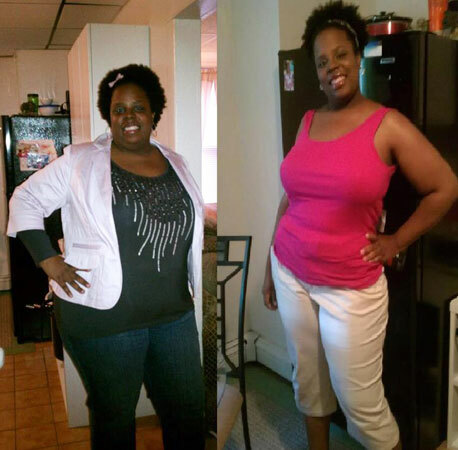 “I lost 85 pounds lost after gastric bypass surgery….and counting!!! In 2010 made a very hard decision to lose weight. It was hard for me because I held on to my weight for private reasons and it was a source of comfort and part of my identitiy for many years. After some soul searching, it was through that process that I realized I was hurting myself holding on to my weight and I made the decision to let my weight go. The weight was destroying me and killing me slowly. I suffered from high blood pressure, sleep apnea and it was beginning to become painful to walk. I was killing myself. With God on my side, in 2010 I had lap band surgery and lost 30 pounds. However, due to the band causing severe acid reflux, I had it removed and went with gastric bypass in December 2011. I had to completely change my eating habits. Right after surgery, I was on liquids for almost two months. I slowly progressed to eating solid foods again. Throughout that process I exercised 3 times a week on my elliptical. Some days, I was only able to do 5 minutes. I had to build up my strength to go longer and harder. Eventually, I began Shaun T’s Hip Hop Abs and I am currently getting my feet wet with his Insanity DVD’s (but they are really tough). Foods that I was able to eat before surgery I cannot eat now, for instance spaghetti noodles, tuna fish…certain breads and certain meats. What this surgery has been able to do for me is force me to control my portion size. I eat small amounts and my body does not crave carbs and sugar. Sugary drinks I cannot have. Ice cream I cannot have, but I can tolerate certain chocolate chips cookies, (which I do indulge in on certain occasions, lol) I must admit, lol. What is a staple in my house is the protein shake. My body craves them now so I make sure I have plenty available. I take vitamins, a gummy multivitamin, b12, Vitamin d, Iron, and Calcium with D3. I have changed my whole life, I now have carrots, and raw veggies in my fridge instead of chips cookies and icecream. I have yogurts fresh fruits water and I have decided to work out and put myself first. There are some days where I get into a “funk” and I don’t work out and I don’t eat healthy, but I have learned to embrace those days. I let them happen and then get back up and start all over the next day. I took me a very long time to make this change and it will take a very long process to maintain my new life and their changes. TP, you look wonderful and I bet you feel the same. I opted for the Sleeve (3/25) and have lost about 20 pounds, its slow going but last week I added 20 mins on my ellipitcal and I too do Shaun T, bit his Rocking Body(15 minsx2) and Rockin Abs…the combination gives me 60 mins of total body work out….on the weekends I jog a lap or two and walk the track…10 times around..not sure what it equates too – I have become addicted to exercising.. I must do it in the morning and when I come from work. Having surgery was the best choice for me, diabetes and hypertension, mild sleep apnea and everything else was killing me, I’m so grateful for the change and the inspiration I get from others who’ve gone before me – no matter what course chosen, the end result for us all is a healthier happy life- God Bless and keep your eyes on your goal !! It’s so interesting how we are afraid to get healthy. I think for some of us, it is definitely the unknown. I was in the Army and the Army didn’t teach me how to eat healthy. I was always running, doing situps, etc. but I was never taught how to eat correctly. Now I am out and I have gained tons of weight. People are saying, “You were in the military…how did it happen that you are so out of shape now?” Eating is half the weight-loss battle. I pray you continue to do well and please pray for me and the rest of us as we go through our weight-loss journey.